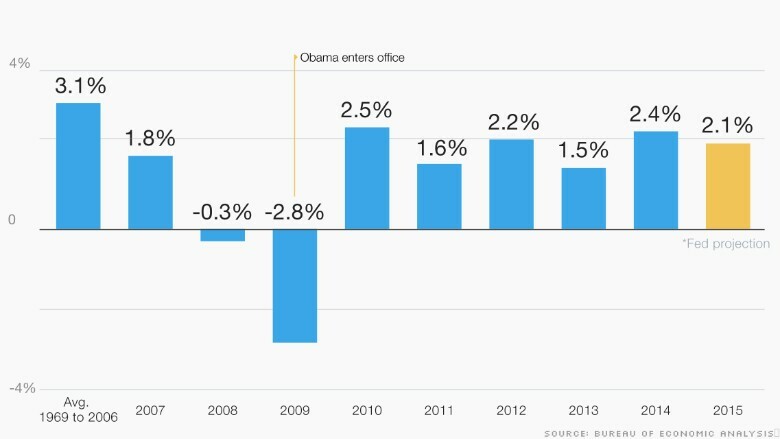 One of the biggest criticisms of Obama's economy is that growth has been sluggish. Historically, the U.S. economy has expanded 3% or more a year, on average. The Great Recession was a meat-cleaver on the economy. Since then, the U.S. has struggled to grow at much more than 2% a year. 2015 was supposed to be a breakout year, but the Federal Reserve predicts growth of just 2.1% as the global economy holds back growth at home.